We are putting together a (non-exhaustive) list of patterns by Janice Anderson. Details and pictures can be found on the page dedicated to Janice’s designs. Below is an overview of some designs and publications featuring Janice’s work. Details and pictures of can be found on the page dedicated to Aurelie’s designs. As Aurelie has started to writing down her designs only recently, this page will grow little by little. Please come back soon. Below is an overview of some designs and soon-to-come designs featuring Aurelie’s work. Hello! with reference to the Herdy sheep knit kit pattern. 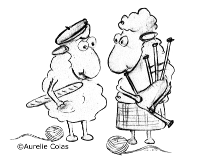 Would it be possible to post the knitting pattern up on your website or send me a copy? I have been searching everywhere for the pattern and given that the knit kits sold out everywhere I have been unable to obtain just the knitting pattern. Hope you can help? The pattern for the Herdy knit kit (Hot water bottle/Toy) will be available as a free download soon on both the Herdy and Rowan website, we will include a link from the blog. I am unable to sent it to you as copyright belongs to them. Should be there for British Wool Week – mid October. Could I please ask if you may have been involved in designing the miniature Herdy sheep that are presenting featured in the Herdy Wool campaign? I would simply love to knit them if there is a pattern available? I am not sure who the designer was for the miniature sheep. If you contact Herdy directly they are sure to help you out.